It is absolutely, positively still winter around Driggs. Storms are coming through every couple of days, and temperatures are cold...looks and feels more like February than April. 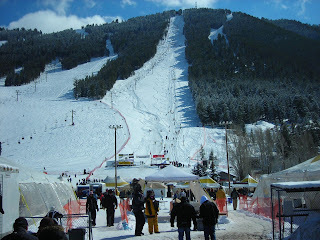 All the snow last week was good for the Jackson Hillclimb. We started setting up our R.U. Outside booth on Wednesday, and I battled the drive back home over Teton Pass that evening in the biggest single storm we've had all year. The cold temperatures came in Thursday and Friday, then another storm Saturday afternoon. I guess it's spring somewhere, but not here. R.U. Outside displayed for the umpteenth consecutive year, and it was a good weekend. 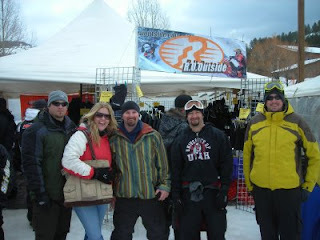 Thanks to my brother Mark & Annie who came up to spend some time, and also the usual boyz Joe, Justin, Matt, MD & co. It would have been a little more pleasant if morning temperatures had been above zero, but it was good for boot & glove sales. We're used to it around here, and we warmed up watching March Madness at night. This was the scene out on Snow King Drive. 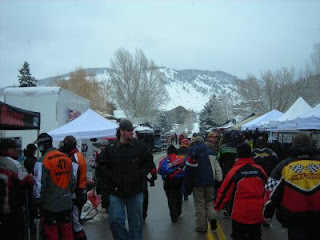 People turned out in droves and cheered racers up the hill. Our friend Dennis Durmas had the most dramatic crash of the weekend, doing a header into the snow after his sled flipped above the third catwalk. His shoulder is aching, but otherwise he's doing o.k. It's a tough mountain, and that top third of it is almost beyond vertical. 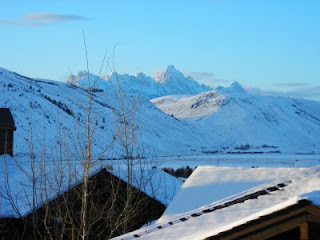 View of the Tetons from our Snow King condo Thursday evening. Not bad.